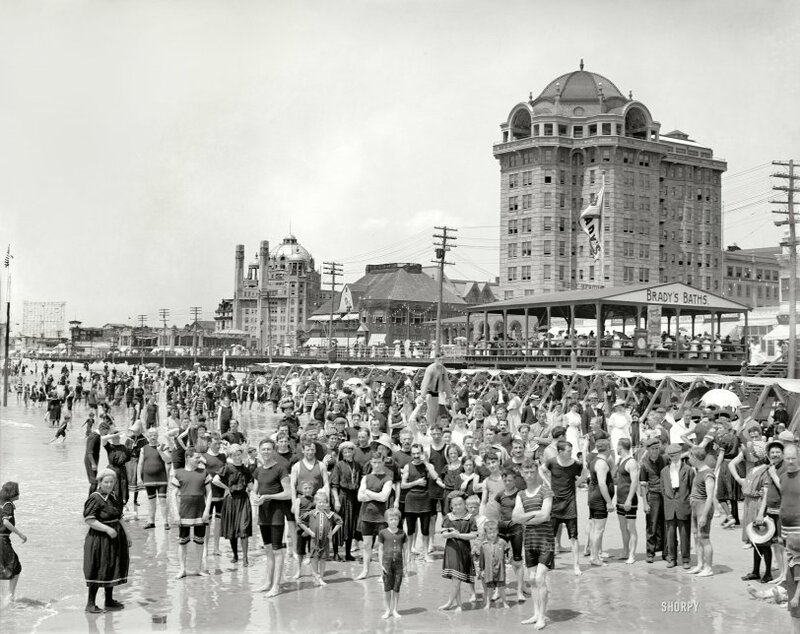 Circa 1906, Atlantic City bathers peering a century into the future. "Hotel Traymore and Brady's Baths." At left, the domed Marlborough-Blenheim hotel. 8x10 inch dry plate glass negative, Detroit Publishing Company. View full size. Submitted by Bull City Boy on Wed, 04/25/2012 - 10:30am. I like the Jerry Colonna-ish fellow near the center front. He's giving the thumbs up sign, which I don't remember seeing before in Shorpy's hundred year old (+or-) pictures. He's having a great time. Submitted by Edvado on Wed, 04/25/2012 - 9:21am. Trying on his sweetie's hat? Submitted by Speechless on Tue, 04/24/2012 - 8:26pm. Over there on the far right of the picture, 2nd man in at the lower right corner, a man with a mustache smiles congenially at the camera, holding the arm of his girl. He's holding his hat strings in his other hand, grinning at us, and seems to be saying "Do you like my bonnet? Is it very fetching?" -- She seems to be calling to someone else, getting them to get a load of him. Submitted by SK_manhatty on Tue, 04/24/2012 - 7:50pm. It may be an artifact of the B/W image, but people in these beach scenes do not look nearly as tanned/leathery as their NJ contemporaries. Submitted by SilentEchoes57 on Tue, 04/24/2012 - 6:02pm. Submitted by jimmylee42 on Tue, 04/24/2012 - 3:51pm. Let me be the first to observe that there seems to be more overweight people in this pic than usual for this period. Submitted by Vintagetvs on Tue, 04/24/2012 - 1:48pm. "Get a load of us!" Submitted by Ice gang on Tue, 04/24/2012 - 1:38pm. along with the other 49,000 other bathers.